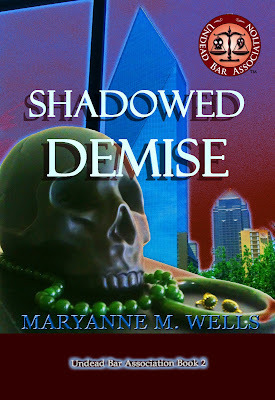 Shadowed Demise Book, the second book in the Undead Bar Association series, publishes November 26, 2012. Shadowed Demise - Fiction. The second gripping novel in the Undead Bar Association Series. From the assassination of President John F. Kennedy to a modern PETA protest, from soaring courtrooms to back alleys and strip clubs, Shadowed Demise is a fast-paced adventure about the long reach of shadowed pasts and the unending fight for justice. 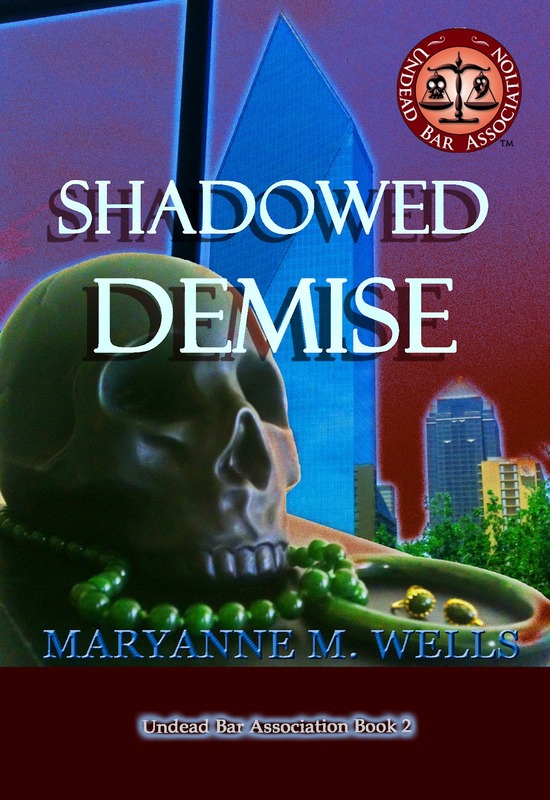 Shadowed Demise is book 2 of the Undead Bar Association series. In book 1, Matriculated Death, the action moved from Maryanne's first year of law school (Part 1) to her second year (Part 2). The action in Shadowed Demise takes place in between Maryanne's first and second years. It answers several questions raised in Matriculated Death, the biggest one being, who killed vampire Clark Lang. Most interesting, and this is purely the author's opinion, it explains the change in Maryanne's attitude between the two parts of Matriculated Death. Someone's getting a little bitter about being a sfi slave. But if you choose to enslave yourself to vampires, what do you expect? Sunshine and roses? This new book is chock full of history, centered around a certain event in November 1963. I spent a lot of time researching the assassination of JFK and the people involved, to give these historic scenes the right flavor. And I can't thank the staff and research librarian at the 6th Floor Museum enough. I also want to thank everyone who talked to me about Jack Ruby or the events they witnessed in 1963, from the manager at the downtown Campisi's to the bailiff and auditor at Dallas County Probate Court 1, who took me under their wings when I was a court clerk and opened my eyes to the history around me. In the weeks following the launch of Shadowed Demise on November 26, I'll share more details about my research. I also plan to post a walking tour of downtown Dallas as it relates to the JFK assassination. There's a disturbing amount of misinformation about where events occurred. I do not claim to be an expert, but I'd like to give some small aid to tourists who want to view the city through a historic lens. Locals might also enjoy learning the history of places they walk past everyday. The city of Dallas does a good job preserving and repurposing historic buildings; it gives us all a rare opportunity to see connections between the past and present. As for the legal issue in the book...it's not pretty. Law rarely is, but guardianship cases can be some of the ugliest. To everyone out there who fights for the incapacitated, striving to protect those who can no longer protect themselves, thank you and God bless. For those who target the incapacitated or the elderly, trying to use them and abuse them, know this: there is justice in the world. It may find you in the courtroom. It may find you ironically, when you're old and infirmed and someone takes advantage of you. It may not find you until Judgment Day. But justice will find you in the end; because it's always there...watching and waiting. Justice isn't blind; it's biding its time. Book 3 of the Undead Bar Association Series is scheduled for release in April 2013. Get ready for the wild west! I'll be taking the action back home to Amarillo, Texas.